Welcome to the official blog of the New England Chapter of the Society of Fire Protection Engineers. Posts include NEC-SFPE news, member updates, and other information regarding NEC-SFPE and fire protection engineering. We hope you all enjoyed your holiday season! Please find attached the Winter 2019 SFPE-NEC newsletter containing a summary of Fall 2018 and a preview of what's to come for the rest of the year. Thank you for a great year and we look forward to seeing you in the future! The Worcester Polytechnic Institute Student Chapter of SFPE with the support of the New England SFPE Chapter recently held a dorm burn demonstration to educate and encourage students to pursue a career in Fire Protection Engineering. We hope you had a wonderful holiday break! Please find attached our Winter 2018 newsletter containing a summary of Fall 2017 and a preview of what's to come for the rest of our calendar year. We hope to see you at the February meeting and beyond. Physical fitness and mobility inevitably deteriorate as people age, and it becomes easier to be injured during any kind of accident, not only fires. As the population continues to age, it is natural that the trend of increasing numbers of deaths will continue as far as the population of elderly people increases. The problem may be also influenced by factors such as deterioration of mutual assistance from family members and communities, as the low birth rate, aging population, and the trend away from multigenerational households continue. However, the risk of death due to fire among elderly people has been decreasing according to the trend in recent years in Japan contrary to our expectation. Although the increased health of elderly people in recent years is one important explanation, it is not the only one to explain the above fact. The increased safety of appliances for cooking and heating, and the increased safety and quality of housing environments also certainly has had an effect. It is also important to improve the health and living environment for elderly people. Reducing fire risks, even a little, and thereby providing a safe and comfortable life in residential homes in which the majority of elderly people live, is something that everyone wants. This lecture will explore the changing nature of fire risks associated with the rapidly aging population in Japan, with potential insights for other countries facing a similar situation in the future. The New England Association of Fire Protection System Designers is hosting its 13th Biennial Fire Protection Systems Product Show. The event will be held on Thursday, March 23rd at The Lantana in Randolph, MA. More information and registration instructions are available in the Product Show Invite. Additional details are also available at NEAFPSD's website - www.neafpsd.com. Please find our latest newsletter, which includes a summary of the first half of our chapter year, as well as information on all of our upcoming events. We hope to see you at a future SFPE New England Chapter event! 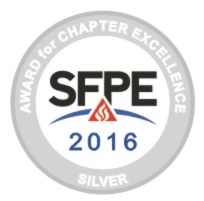 The New England Chapter of the SFPE was recently given a Silver Award for Chapter Excellence for the 2015-2016 chapter year. Congratulations and thank you to all of our members for helping to make last year such a success! The SFPE is offering various seminars as part of its 2016 Professional Development Week. Offerings include seminars on the protection of storage occupancies (NFPA 13), application of fire risk assessment in fire protection design, and flammable and combustible liquids. More information, including dates and registration information, is included on the SFPE website.